You've inherited a home, only to discover restless spirits lurk, and only you can hear them. Years ago, a woman plummeted from an attic window to her doom, now she haunts her former home from another realm. Help her with her unfinished business and put her soul to rest in this incredible Hidden Object Puzzle Adventure game. Commune with the dead, and solve the mystery of Emily's demise. 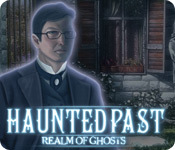 All is not as it seems in Haunted Past: Realm of Ghosts.